The 90s heralded a change in format for many a rock band. MTV kicked off their unplugged series, and some of them were damned good. Looking back, Pearl Jam and Queensryche were personal favourites in this MTV format. Then Tesla came along a blew away all-comers with their 'Five Man Acoustical Jam'. Just like 'Mindcrime' is the modern concept album to be judged by, Tesla followed suit with 'FMAJ'. Everyone tried it in the 90s, and I mean everyone, come with not so favourable results unfortunately.You know who you are. So 2012, sees one of USA’s finest taking on the acoustic genre, 20 years later than the rest. Me personally, I'd rather see them come out with a live set of rockers, especially as their (and I use this term in its loosest sense) ‘UK Tour’ consisted of one gig in London, 2 yrs in succession. Go North next time!!!!!! So yes I'm jealous that I couldn’t go to London twice to see them. I'm over it now, nah I'm not! Titled 24 Strings and a Drummer, it asks the question of keyboardist Eric Levy. He clearly plays a part, as he proves on his intro to Sentimental Street, so throw in the number of keys as well!!! Night Ranger start of with some well known tried and tested faves, ‘This Boy Needs To Rock', & 'When You Close Your Eyes'. The newer and very decent 'Growing Up In California', gets an airing, but the first ‘prick of the ears’ moment is the very cool 'Secret Of My Success'. 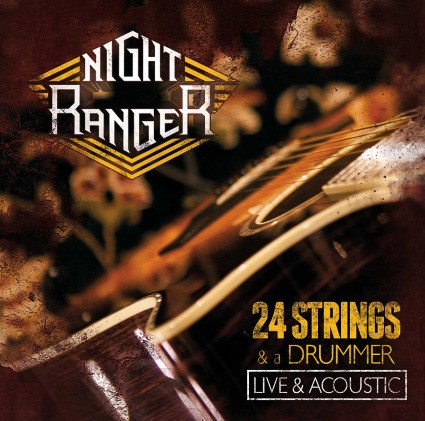 Night Ranger wouldn’t be Night Ranger if they didn’t have the golden tonsils of Kelly Keagy, and still shows he has what it takes on their mega hits Goodbye and Sister Christian. I love Jack Blades to bits, but Keagy gives them a different sound. The band really sound as if they are enjoying the gig immensely. Don’t Tell Me You Love Me is as good as the electric version, and they close out with 2 highlights in You Can Still Rock In America, and a cover of Don Henly’s Boys Of Summer. 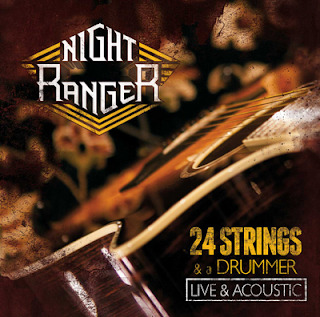 24 Strings and a Drummer (and a keyboard) shows what a legacy of songs that Night Ranger have in their song writing portfolio. I’d have loved to have seen them play something (nay,anything) from the very underrated Man In Motion. Again, I know nothing! CD: This Boy Needs To Rock; When You Close Your Eyes; Sing Me Away; Growin' Up In California; The Secret Of My Success; Sentimental Street; Four In The Morning; Let Him Run / Goodbye; Forever All Over Again; Don’t Tell Me You Love Me; Sister Christian; (You Can Still) Rock In America; Boys Of Summer (Bonus Track). DVD: This Boy Needs To Rock; When You Close Your Eyes; Sing Me Away; Growin' Up In California; The Secret Of My Success; Sentimental Street; Four In The Morning; Let Him Run / Goodbye; Forever All Over Again; Don’t Tell Me You Love Me; Sister Christian; (You Can Still) Rock In America. Bonus feats: Night Ranger all access - Growin' Up In California(videoclip) – Making of the Album “Growing Up In California”. Great new scheme from AFM!! !